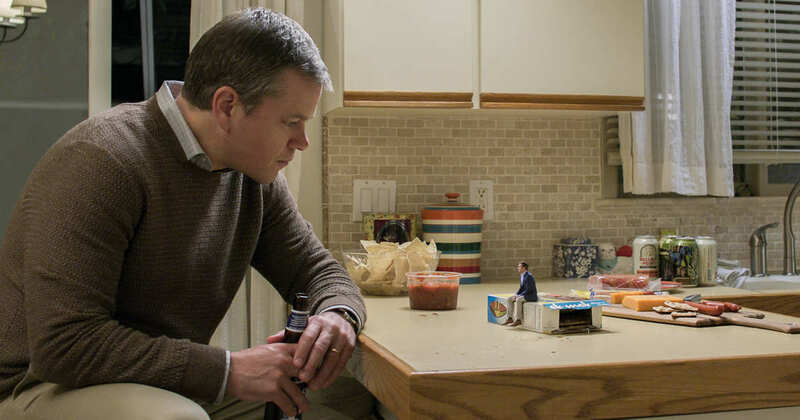 The hook for Downsizing is a simple one: Alexander Payne does sci-fi. For many who have followed the director as he's frequently charted the discombobulated lives of normal, everyday people, this is probably a cause for concern and excitement. 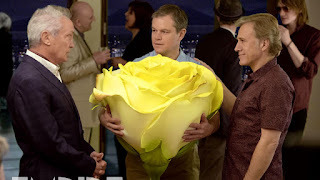 Well, just stick with that, because Downsizing is every bit an Alexander Payne movie but flipped on its head and, ironically, blown up to gigantic proportions. His knack for human comedy is still there but this may be the most hopeful film we've seen from Payne yet, even if some of the personal themes he relishes are swallowed up by the larger ideas the genre affords. No matter what, Payne's casting is top notch and his nails two home runs with Matt Damon and the invaluable Hong Chau. Whenever Downsizing starts to get too big for its britches, the thoughtful, warm-hearted normalcy of Damon and Chau's characters shines through. When overpopulation becomes too much of a drain on the planet's resources, Dr. Jorgen Asbjørnsen (Rolff Lassgard) devises an ingenious solution to the problem. He's come up with a way to literally shrink down the human population, devising that smaller people will consume much less. Within years communities of "smalls" are everywhere, with entire families living like kings in what amount to dollhouses. Why? Because all of that money you have stretches a lot further when your car is the size of a Matchbox. And that becomes the main reason why people decide to shrink down; not because of some desire to save the planet, but to save money and change their lives. Those who need some convincing can sit in on an infomercial, featuring tiny Neil Patrick Harris and li'l Laura Dern, living it up in their fun-sized McMansion. That's where unhappy married couple Paul and Audrey Safranek (Damon and Kristen Wiig) come in. He's an altruistic everyman and occupational therapist who hates his job and hates the mountain of debt he can't climb out of. He and Audrey not a change, so they reluctantly agree to get small together, but circumstances quite beyond his control find him the only one who has gone through with it. That leaves Paul all alone, with his giant-sized home and his giant-sized wedding ring, now meaningless, in the happy Leisureland community. 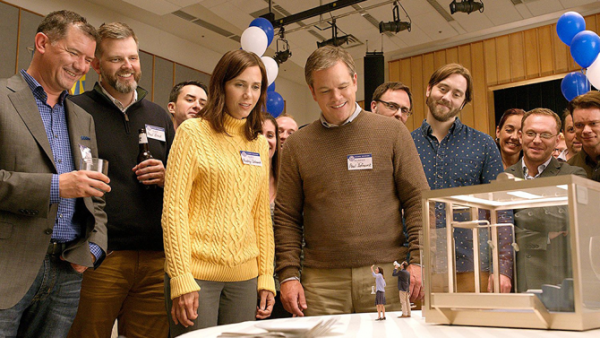 The beginning of Downsizing is where Payne and co-writer Jim Taylor make the greatest use of the high concept. It's fascinating to watch them explore the banal daily occurrences in the life of someone who is about 5-inches tall. Paul still needs to find his new life and so he needs a job, and traveling great distances is a different kind of headache. And Payne uses this chance to explore some intriguing political angles, like the idea that the small contribute less to the national economy, and thus shouldn't be privy to the same level of entitlements. As Paul becomes involved with a pair of black market dealers (Christoph Waltz and Udo Kier in annoying Euro-trash mode) who use their tiny status as a money making opportunity, Payne unveils his true plan for Downsizing. It's not to sit back and simply have fun with the concept, his own personal Honey I Shrunk the Kids. His ambitions are much broader. 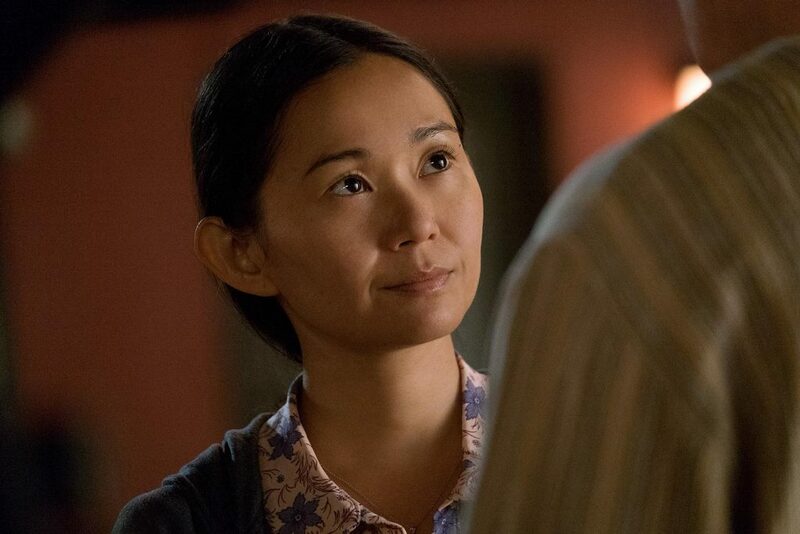 Chau surprises as the film's true central character, Ngoc Lan, and her backstory will have eyes rolling from sea to shining sea. A one-legged Vietnamese immigrant who was forcibly shrunk after she was imprisoned, only to escape into America inside of a TV box where she was captured and forced to work as a housecleaner in Leisureland. When not sweeping up after the likes of those wealthier than her she resides in a ghetto just outside of town. Her English is broken and she's at first very off-putting, making demands of Paul that he is too selfless to refuse. Our initial instinct is to dislike her, but Ngoc Lan seems to evolve just as Payne's narrative grows beyond its most basic premise. 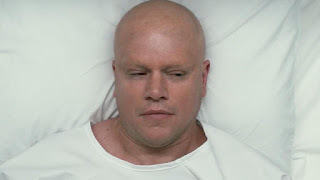 As she becomes an unexpected fixture in Paul's life, he begins to look at the world beyond what's right in front of him. Payne fully embraces the sci-fi conceit, going so far as to posit an entire doomsday scenario created by the shrinking technology. The film begins to drift along, unfocused, while Payne explore the idea of religion in a world where shrinking exists, while also touching upon the continued economic, social, and racial inequality that shrinking was unable to solve. 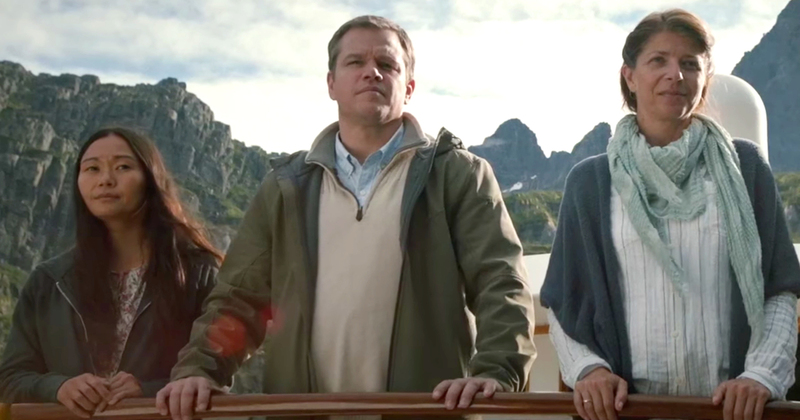 Downsizing takes on more than it can properly handle, despite the winning turns by Damon and Chau. Where the film is an unquestioned success is in the visual effects, with Phedon Papamichael's cinematography, Jim Price's visuals, and Stefania Cella's production design creating a perfect microcosm of a larger world. It's more than just making normal setpieces small, but capturing their depth and proportion to normal-sized objects that matter most. They could've been a major distraction if done poorly, but they pull it off and make it look surprisingly easy. Like the disillusioned characters we've become so familiar with in Alexander Payne's movies, Downsizing ends in a very different place than where it began. From a kooky idea ripped from a B-movie plot emerges an engaging love story and humanist tale. Payne's ambitions may get away from him a little bit, but there's no downsizing how big the film is on ideas, heart, and sincerity.